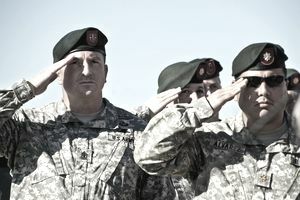 The U.S. Army Special Forces wear their trademark green berets. Airborne soldiers wear a maroon beret, and other soldiers in the Army wear black berets. Army Rangers wear a tan beret, and the Air Force special operations teams also wear berets. What Is A Military Beret? A beret is a hat that is generally flat on the top and usually made of felt. They are sometimes worn as part of military and law enforcement uniforms, though they are folded, shaped and worn in a different style from those commonly worn by civilians. Military berets are not designed to be worn off the rack. They must first be shaved and shaped to present the sharpest form and fit befitting the military image. There are several methods for achieving the proper beret shape. If you are new to shaping your beret, seek out advice from experienced soldiers to avoid damaging it. Note: If your beret comes with a liner (not all berets will have a liner), remove the liner by cutting it out. You'll need a razor (a disposable one is best) and some warm water. Using a disposable razor, shave your beret, beginning at the center and shaving toward the outer edge in circular motions, until you have a very smooth surface. (Some people use a cigarette lighter to burn off the fuzzy material). Be careful not to shave the same spot multiple times as this will wear the material thin and may create a hole. Turn the beret inside-out and shave the inside of the beret as well. You may have to change your razor if it becomes dull—you don't want to accidentally cut the material. Cut the tag off below the beret size lettering. You've done it right if, when you put the beret on, the tag can never show even if it gets flipped over. Pull the headband drawstring tight and tie it off in a square knot. Dunk your beret in warm water—do not use hot or boiling water, as this can cause the wool to shrink. Once your beret is damp and pliable (if it is dripping wet, gently wring out excess water), place the damp beret on your head. Adjust it to proper fit. Pull the cardboard stiffener so it is centered over your left eye and smooth the material over your head. Fold the extra material over to the right forward side of your head, pulling it down towards your right ear. It should just touch your ear or go just below that. Wear the beret for a while until it has begun to dry. Carefully take off the beret and set it aside to finish drying. You may need to shape it a few times to get it right. Once you're happy with how it looks, cut the excess drawstring off and get your flash sewn on. Many people's heads don't fit the "issue" beret. Go to the PX and try one on. You may have to buy one commercially instead. Don't skip shaving the inside of the beret—unless you like pulling fuzzy material out of your hair. If your beret is too big, you can shrink the material by soaking it in hotter water.